The creation of a socially just and stable society in Pakistan, where children and young people grow up as aware, active and participating citizens who are able and willing to make significant positive contributions to their communities. In Pakistan’s increasingly violent, intolerant and fractured society, investment in children is tragically still not recognized as a long term preventive solution to the rapidly decaying structures in the country. Education in Pakistan is socially irrelevant, children are growing up in fear and without hope, they are apathetic & disconnected from their communities and are unable to make sense of the complex world they live in. We at CMPHR believe that without quality investments for children, particularly in socially relevant education, there can be little hope for the long term improvements in the country. We think that for society to develop and progress through contributions from an educated, aware and participating citizen, an entire generation of children needs to be trained to be able and willing to contribute to change. 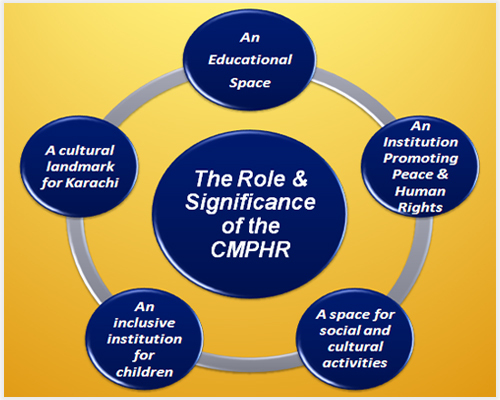 CMPHR strives to contribute towards the development of a socially just and tolerant society in Pakistan by providing socially relevant educational experiences designed to help children. Understand the world they live in and positively alter their attitudes, values, and perceptions with respect to human rights, peace and social justice. Develop skills, motivation and willingness to take greater interest in, and make positive contributions to, their local and broader communities. By helping children understand the world they live in, positively altering their values with respect to human rights, peace, social justice, tolerance & diversity and by helping them develop skills, motivation and willingness to make positive contributions to their communities, the potential of CMPHR’s impact is immense. It could well be the greatest initial investment for laying the foundation of a socially just & tolerant society in Pakistan.